Snowmageddan 2015 wasn’t a total waste. As a matter of fact, God laid on my heart to write and since I teach high school, my time is limited until June or July. I prayed that if God wanted me to write, that He would give me time. 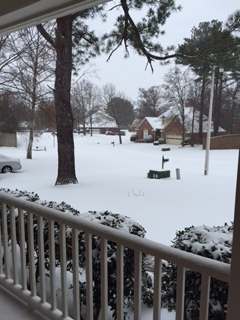 And then came Snowmageddan 2015! We were out of school a week and a half. One project was to get Daniel: An Uncompromising Faith in print again. Some of you have older copies of it, but it needed some editing and touching up. This bible study came as a result of my and Robert’s time at Thompson Station Church, where a Sunday School class of four turned into five classes of ladies studying God’s word. 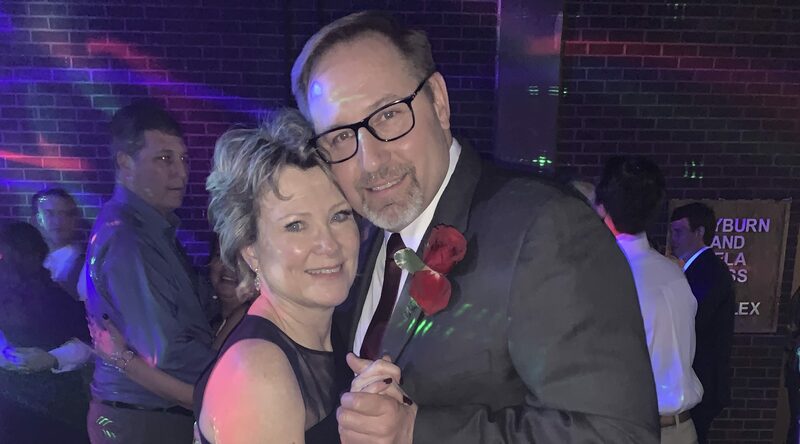 Those ladies meant the world to me, and one of them, Kim Houston, is still one of my best friends. In those days together, God planted in me a desire to minister to women, and that desire still grows. One precious friend Stacy Turnbull said one Sunday morning that she wanted to study God’s word but just could not understand it. 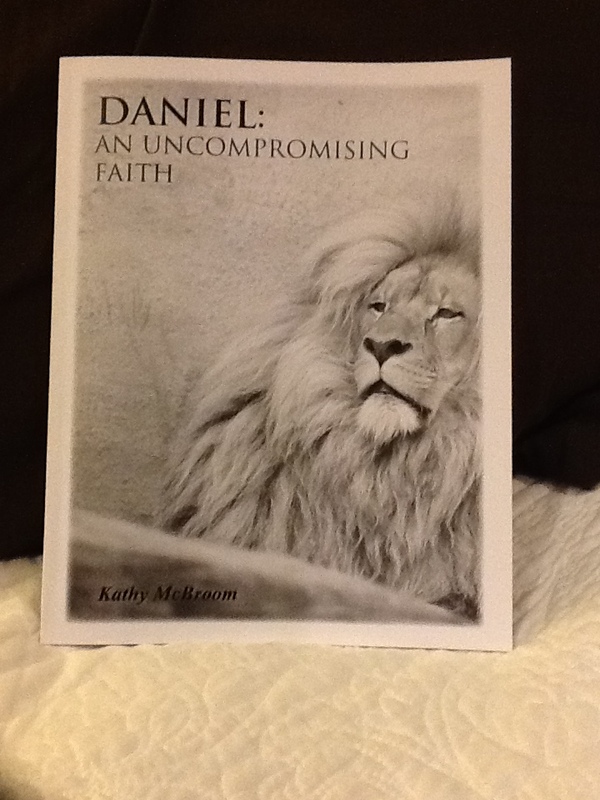 Thus came Daniel: An Uncompromising Faith. Contact me to get these or if I can help your ladies’ group study this. I love the lessons in Daniel! Here is a copy of part of week one. It is a four week bible study. Let me know if I can send you one. They are $10.00 plus an extra $2.50 for shipping. Contact me at kathymcbroom@yahoo.com or by facebook. I will also be selling these at two women’s gatherings where I will be speaking in April. You can pay me by paypal of you have an account with that or by check. Please excuse the fact that some things may not come out quite right below since I am copying it from my manuscript. Daniel was just a young Jewish boy when his people were cast into exile. At a young age, his faith was going to be tested. In a strange country, he could be asked to worship other gods and forget his entire Jewish heritage. How would he hold up? Having faith under pressure is difficult at best. Many have stood and lost their lives. Jim Elliot, along with four other missionary friends, were speared to death after three months of friendly contact with a remote, unreached tribe in Ecuador. Others, like me, sometimes fold. I can think of opportunity after opportunity that I have let slip through my fingers. I am very thankful that God does not need me to accomplish His purpose, which we will see some examples of in Daniel, but I am blessed tremendously if I am obedient. Also in the middle of times of trouble which Daniel faces immediately in chapter one, God protects His children. This may be difficult to comprehend, especially if one stands for his or her faith, and the outcome is much less than heroic. As mentioned earlier, many stand and are killed. That might not be what we had planned. If one dies for his/her beliefs, how is that God’s protection? As a Christ follower, I am protected from an eternity in Hell. I might rather think of protection as part of this side of heaven, but God’s ways are not our ways. According to the book of Revelation, these martyrs get a special place in heaven. Revelation 3:21 states that to him who overcomes, he will receive the right to sit with Jesus on the throne. In Revelation 6:11 each will be given a white robe. I am covered by the blood of Christ and therefore protected for all eternity. But, practically, how do we stand the test day after day? Does God bless that obedience and protect His children in any ways this while still on earth? Let’s take a look at Daniel 1. Read Daniel chapter 1:1-9. What very strong stand did Daniel take in verse 8? In verse nine, in what ways does God sometimes change a person’s heart? Do you think God still softens hearts today? Name an example of this. God hardened Pharaoh’s heart. He did this so that He would be glorified. God glorifies Himself through people, whether they want Him to or not, through circumstances and through creation. He cannot help but be glorified because He is God. He will bring about His purpose. And He definitely had a purpose for Daniel. Read Daniel 1:10-17. What did God give these four men? What did they have to do before God gave them this? God gave these guys wisdom and knowledge, but first they had to obey. According to Job 28:28, what is wisdom and understanding? Proverbs 9:10 says that the fear of the Lord is the beginning of wisdom, and knowledge of the Holy One is understanding. Let’s look for a moment at the other side of this. Read 2 Corinthians 4:4. First, who is the god of this age? Second, how does Satan keep people from wisdom and understanding or, in other words, God? Satan is a liar and deceiver who will do whatever to keep people from Christ. He blinds them literally to the truth. We are to be truth shedders. When witnessing to someone lost, many times he or she will seem puzzled at the truth we are trying to share. A lost person might come to church, but leave confused because without the Holy Spirit living inside of him, he cannot understand the gospel. It is truly a miracle when God reveals truth to them, revealing the lies that have kept him from Christ. It is imperative that we pray for our lost friends, asking God specifically to remove the blinders from their eyes that Satan has placed there. Read Daniel 1:18-21. In verse 20, how much better was Daniel and his friends than all the others? Remember that we saw in Day one that wisdom and understanding come from God. As Christians we possess that same wisdom and understanding that Daniel had. I am sure it was intimidating to the magicians and enchanters that these young boys possessed wisdom that they knew nothing of. How can we be sure that we are growing in our wisdom and knowledge? Being a Christ follower will require us to be different. We must step out on faith, following God’s commands, and then He will bless us. He will NOT bless us before we obey Him. Wisdom and knowledge only come from the Lord. Satan blinds us and can lead Christians and non-Christians down paths to destruction. We must be praying for the lost and each other. What God is showing me today?